There is no better way to enjoy the outdoors, than astride a beautiful horse. And if my aching muscles were anything to go by, get a nice little workout thrown in! As my childhood pleading had never paid off, it was actually as an adult that i finally took those first lessons, and realized how rewarding horse riding can be. Healthy ... of course, and as you mount the horse the new challenge means daily stresses are left far behind. In Taipei city, though barely room to swing a cat, there is in fact place to ride a horse! 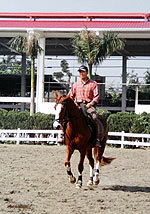 Conveniently situated just minutes walk from Shi Pai MRT is the highly professional Hannover Equestrian Club. Boasting over 60 horses, local and an international coach, and even lessons in Dressage and jumping, rates are subsequently a little higher than other places. A trial lesson (20 minutes) is NT$1350, and then options are membership or coupons - 25 lessons priced at NT$63000/70000 (Tues.-Fri./Tues.-Sun.). Coupons can be shared. To escape the city, head to Danshui. The Beach Country Riding Club is wonderfully located near Sha Lun beach, allowing students advanced enough to arrange beach rides. Lessons are NT$2500 or 10 for NT$17000/20000 (weekdays/weekends). Shan Hai Guan Riding Club occupies a large area in a beautiful setting in the hills between Danshui and Bali, so your own transport is really required. 10 lessons are NT$14000. And in Xi Zhi is Omega Riding Club, another of the cheaper options with a single lesson costing NT$1800 or 10 lessons for NT$15000. All places mentioned offer basic tuition upwards, Chinese and English instruction, and usually work on a one to one basis. Lessons are 40 minutes and must be booked in advance. Check the websites for pictures, maps and transportation. And then, go on ... saddle up and enjoy!